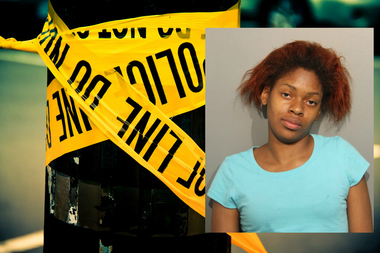 Keona M. Peterson, 20, is charged with five felonies after using racial slurs while beating a woman in Edgewater. EDGEWATER — A playground spat between small kids ended with hate crime charges for a Chicago woman who allegedly attacked a mom in Edgewater while saying, "I'll cut you up white girl." Keona Peterson, who lives in the 1000 block of West Foster Avenue, was also charged with four additional felonies, including robbery, aggravated battery, participating in a mob action and unlawful vehicular invasion, police said. According to police, the attack happened Aug. 6 about 5:35 p.m. in a playlot outside the Helen C. Peirce School of International Studies, 1478 W. Gregory St. The victim said there never was a confrontation between her and the woman, who allegedly spearheaded the attack against her with four other women. The 44-year-old victim was admitted into Swedish Covenant Hospital in serious condition, police said, though she did survive the beating and was later released. The victim, who spoke to DNAinfo Chicago but requested she and her girls not be identified because she remains "afraid for her life," said she was given a CAT scan at the hospital but did not suffer any breaks or permanent injuries. "The scan was on my face because it was so bruised and bloody, but it was only major bruising and a badly swollen eye," she said. "The girl bit me three times on the hand, I was head butted, it was just disgusting." It began with a young boy who seemed to be unaccompanied, first shoving and then punching the woman's daughter and her daughter's friend on the playground, the victim said. She had decided to leave with the girls when the little boy trailed them from the playground. On the other side of the lot, near the swingsets, she saw a woman pushing two girls and asked if the boy was hers, too. "She didn't even respond," according to the victim. "I'd just said, 'Excuse me, is this boy yours?' And she gave me the dirtiest look." With both her girls crying, she said to the boy, who she estimated was 4 years old, "Well, both of the girls are crying, why don't you say you're sorry?" Then, according to the victim, the boy said, "I'm sorry," and went off. She added, "I thought that was the end of it." But the woman at the swings, who later would be identified as Peterson, began yelling at her. "She starts shouting at me and I just waved my hands up and said, 'We're leaving,'" the victim said. But as she buckled her girls into the car, Peterson grabbed up her own girls, walked them to an apartment building and "threw them inside" before running back to the victim's car and pounding on the window, the victim said. "She was just shouting, 'Hey you! Hey you white girl! I'll cut you up white girl, this is my territory, my neighborhood, get the f--- outta here! There's thousands of acres for white people, what are you doing coming into my neighborhood?'" Four more women, apparently friends of the attacker, showed up at the vehicle, which is when the victim said she "got really scared." "She just opened up the car door and started punching me," the victim said. "I burst out crying, she'd busted open my lip and I was bleeding. I pushed her hands away from the door and slammed it shut. I held it closed and they walked back toward the building." The attack was far from over. When the group went back into the building, the victim left her car with the girls strapped in and walked over to snap a picture. She did not know the address and wanted the photo for the police report she planned to file. When Peterson saw her, she ran back out of the building and caught her. "She boxed me in the head, grabbed my hair, took my phone and started beating me with my phone. Then the others started beating me. I just kept screaming for someone to protect my girls. I was so scared they were going to do something to the girls. They saw the whole thing from the car, they were just screaming, watching it happen to me," she said. There's no telling how long the pummeling would have gone on if a man and woman walking past hadn't interceded, the victim said. The man grabbed and shoved at the attackers while one woman grabbed onto her and physically dragged her out of the pile. The mob scattered after the victim was pulled clear, heading back into the apartment building. "I was just in a state of shock," she said. "I've never been so scared in my life. This was a hate crime and that's the truth. I honestly thought they were going to beat me to death, I really did." Officers were flagged down by a witness and directed to the apartment, where they found Peterson, who admitted being part of the attack, police said. The victim then identified Peterson as the ringleader, according to police. "The police were amazing," according to the victim. "One police woman arrived on her own. I said, 'Please don't go in there alone, they're crazy.' A witness who was there, back at the car with the girls, said, 'Don't go in, wait for backup.' But she says, 'I'm fine, stay here' and she goes in because she doesn't want to lose them, and then backup came and went in and they searched the building and brought her out."